With a completely clear construction and versatile 2 qt. capacity, this Choice 2 qt. clear square polycarbonate food storage container makes it easy to store ingredients, as well as fully prepared food. The crystal-clear design takes the guess work out of trying to identify what food product is stored inside. At the same time, the virtually-unbreakable polycarbonate design guarantees the longevity you need in your commercial kitchen. The textured bottom of the container provides durability against scratches and doubles as a non-skid surface meaning your container won't easily slide around. 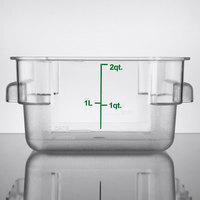 And this food storage container's square shape means it maximizes storage space with no wasted space around the container, up to 33% better use of space than standard round food storage containers. We love size of this container. It's perfect for that one product you need a home for that you don't use all that often and even when you do use it, you only use small quantities of. Love that it has handles! Clear container. Products inside container are easily viewed. Size perfect for storing dry or wet food. Containers fit on shelves and stack easily. Great organization tool. The choice 2 qt storage container works great for proofing pizza dough. It could only hold about 2 dough ball. It is marked so it is easy to notice if the dough is rising. I also use it to store soup. These 2 qt. storage containers are such a great size, perfect for storing salad dressings, chicken/tuna/pasta salads, anything of a smaller quantity really! They stack really well, and the square shape is so much better at allowing us to better utilize small shelf space than the round containers. Love love love these containers! They are really sturdy & makes storing ingredients a breeze. I love being able to see what I am looking for. Will be ordering more! perfect storage for leftover frostings and ingredients, container is easily cleaned out with spatula to utilize all contents. Dishwashing is easy and product is durable. Good quality polycarbonate food storage container. Handles are a nice touch with drainage holes for dishwasher use. Fits the Choice 2qt/4qt lids in both green and white. The green lid is a bit floppy, whereas the white is very stiff. We love using these! We use them to put off of our back stock toppings in so its easy to see and be able to pull from! Bought these containers because I lacked storage in my classroom. They stack really well. The seal closes perfectly on the container. The label is clear and easy to read. These containers are so convenient. I love that the lids match both sizes, and the square shape makes so much more sense than round for fitting into coolers and food carriers. These are a great, durable dry or refrigerator storage solution. The color coding with corresponding lids makes it easy to match up containers and lids together. These quart containers are perfect for storing cut up vegetables or left overs. Stacks very well and the graduated markings are easy to read. They are durable. I love these. I have had these in that past and paid a bunch. Here I did not pay to much. So glad to have found them! Any time I've been in charge of ordering supplies and equipment for a kitchen, I make sure to include half a dozen of these. The size is perfect, the construction is flawless, and they can stand repeated heavy dishwasher beatings. Purchased a few different style storage containers in the past and was never satisfied until I got these and they serve all my purposes being air tight, very sturdy and strong and clear so I can see whats inside. Needless to say I would recommend in any restaurant and kitchen. These are a very convenient way to be able to make sure that you have the proper amount of product. I like to store leftover soup in these. We use this 2 quart square food storage container to store our rainbow sprinkles with. It is clear so you'd know exactly the stuff being stored. That is good. CONVENIENT product! I appreciate the ability to stack this container. I also like how durable and thick the plastic is. The measurements on the side help as well. I'm happy that this product can be used in the refrigerator as well as in the freezer. HUGE double bonus! I highly recommend these containers! The containers are great! About the size of beans jug and stack nicely in my fridge about two deep. Easy clean and dish washer safe. Unbreakable high quality container. I love the handles and the clear plastic. i have abused the heck out of them (hot AND cold) and they hold up like little 2 qt warriors. These are a great product! They keep food fresh and are extremely durable. I have put these through a high temp dishmachine many times and they still look brand new! Can't beat for the price. Love love love these containers! The handles help with carrying, they stack very nicely and they last much longer than other containers. We use them daily! Clearly labeled on the sides for easy viewing. Whatever you are storing, dry or wet, you can know what you are reaching for since the container is see through. They also stack well if you have the appropriate lid. You can never have enough of these containers around. These fit perfectly with the green lids and keep your products air tight and fresh for much longer than plastic wrap. Plus they stack great saving you precious storage space. This product meets my business needs. It is of good quality and at a great price. It cleans up easily and seems like it will last a long time. The lid fits very tightly. High quality containers. I use this smaller one to cool veal Demi so that I can portion them into square cubes. It can handle the high heat so it's perfect for that use. Great product for storage and making up quick prep for items in the deli action station. Chef's love thats its durable and cleans easy with no mess. These containers are fine but do not fit the lids that I purchased. There are separate lids for the containers without handles. I must have followed the wrong link. Bummer! Nice to have at the front prep area for those things which you don't always use so much of. Clear containers are always the way to go for all things which don't mind the sun. Not sure what we ever did without these. They have organized our random bags into a space saving dream. No longer have to worry about a bag of rice spilling open in the pantry. I use these for holding house blended ingredients (cinnamon sugar, nashville hot sauce, etc). They work great and it's easy to see exactly how much product you have left. They also stack nicely. These are a really nice small size for holding toppings and sides. They are sturdy and durable plus, because they're clear, you can easily see what's in them. This keeps our kitchen prep organized and makes the walk ins organized. We use the dissolvable shelf life labels so they stay health code compliant. Love the measure on the side of the container! A great product well worth the price. I love the size of this for our cole slaw and the marking on the side make it easy to prepare just about any dish. This is a great product. We use them every day in our coffee shop business. Has plenty of space for everything that we need to store!